Use the calendar below to schedule your jury in order to pass-off certificate requirements and earn your guitar certificate. A jury is a panel of On Chord Academy teachers who will ask you the exact requirement questions listed in the front of your student guide book. You will then demonstrate your knowledge of those requirements. The jury will grade your presentation and will determine if your mastery of the information is sufficient to earn your respective certificate. HOW OFTEN ARE JURIES SCHEDULED? Juries are scheduled once each month. You are only able to sign-up for a jury 60 days in advance. If you'd like to see a calendar of all upcoming juries this year go to On Chord Academy's Event Calendar. If the time slots are full and you'd like to request we add more, please email [email protected] and request additional jury times added. 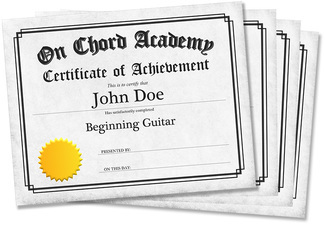 After successfully completing your jury you'll earn an official guitar certificate (Foundational, Beginning, Intermediate or Advanced) on heavy parchment with On Chord Academy's official school seal. It's a high quality certificate meant to be framed and displayed. You'll also earn a colored guitar strap indicating your level of achievement (think: karate belts). The registration fee to schedule a jury is $29.50. The purpose of the fee is to pay for the teachers' time, the cost to schedule studio time, the cost of the certificate, and the cost of the guitar strap. The registration fee is non-refundable. However, if a student fails to pass off their certificate on their first attempt they will be eligible to schedule one (1) more attempt without a new registration fee. Has your guitar teacher signed off on each unit in your Student Guide? Have you studied (and will you continue to study) all the jury requirements so you are confident to demonstrate your knowledge at the jury? If you answered "yes" then please use the calendar below to sign-up for an upcoming jury. If you have any questions, please don't hesitate to reach out to Jordan Olsen at [email protected] or by calling 1-844-ON-CHORD ext 1.